Something powerful is coming. At the end of issue 15, we hear the Elder Martian begin to tell Martian Manhunter the story of Perpetua. According to Starman, this is a story that could destroy the universe itself. So what is this story? And what about the rogue Thanagarians? And back on Earth, what can Starman do to help the heroes of Earth prepare for the worst? 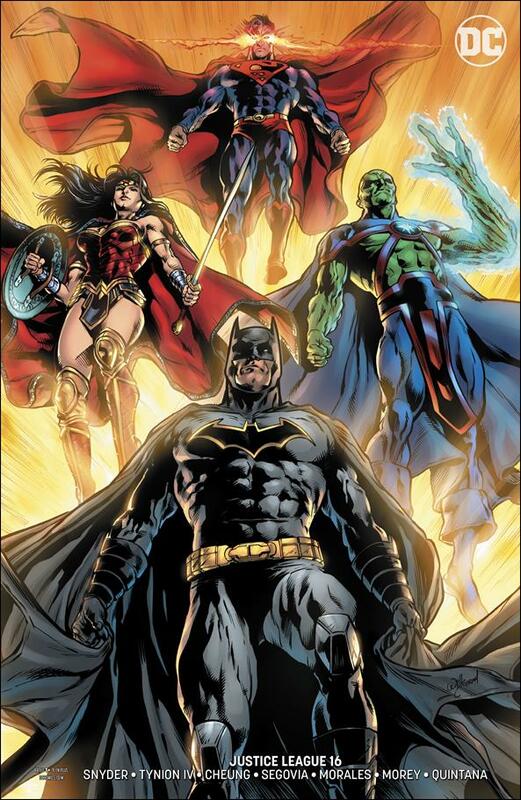 Make no mistake, the Justice League has their backs up against a wall. As the Elder Martian explains, Perpetua was the one who shaped the universe with the seven energies of creation. As it turns out, Rebirth brings back another name we haven’t heard in a while: Krona. Krona had ordered the people of his planet to gather as much information as possible about Perpetua to keep her at bay. They made a point to track down every trace of her mark and hide it, because they believed that if her mark was ever uncovered and it’s meaning was unlocked, Perpetua would return. Her return can be seen in the new forces that have been awakening across the universe, and things are about to get much worse. The Elder Martian reveals that not only is she dying, but when she dies and the illusion of Thanagar Shayera used her to create falls, “chaos will unleash itself on the universe.” She then reveals that the species that was helping Krona evolved into the Guardians of the Universe, who hid away all knowledge of Perpetua. However, one aspect of the story caused fear throughout all of the Guardians. The army that Perpetua created was made by mixing the DNA of humankind and Martiankind together. After Perpetua was locked away, the two species were split in half, with Martians taking the stronger mental capacity and humans getting fire. Later, a group of human scientists discovered the hybrid species and attempted to recreate it. The Martian they used for this experiment was Martian Manhunter himself, tying him to Perpetua. To say a lot happened would be an understatement. Not only did Perpetua make an army of human and Martian hybrids, when the creatures were recreated, J’onn’s blood was used. And now that the Green Lantern Corps and Shayera are firmly back on the Justice League’s side, the heroes can focus on their new mission: fixing the Source Wall. A strong finish to an unexpectedly good arc makes this essential for the series. When the arc started, I wasn’t sure if I would care too much with everything that was going on at the same time on Earth. However, by the end of the first issue, I was hooked, and it only got better. My hope is that Snyder can keep this momentum going as the League attempts to fix the Source Wall and stop Perpetua.